With the dust barely settled after the International Monetary Fund and World Bank raised hopes at their annual meetings in Washington, DC that a long-awaited growth revival is materializing, the global economy received more welcome news from the other side of the world affirming a turnaround. During their weekend conclave in central Vietnam’s historic port town of Hoi An, finance ministers from the 21 Asia-Pacific Economic Cooperation (APEC) member economies provided reassurance that forecasting aligns with the situation on the ground in the region significantly behind the renewed optimism. In a departure from recent, less sanguine encounters, APEC finance ministers, whose diverse Pacific Rim economies account for 40 percent of the world’s population and 60 percent of its total GDP, offered a picture of easing downside risk, higher growth, and an encouraging near-term outlook. Economic confidence, reinforced by favorable data assessments from within the region, would suggest that the decade-long recovery from the global financial crisis has reached a legitimate turning point, market risks notwithstanding. 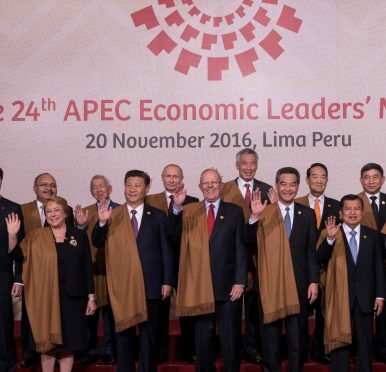 What is less clear is how long these conditions will persist and to what degree without some major structural changes that touch at the heart of what makes APEC an engine of the world economy and which its leaders will seek to address at their summit 30 kilometers from Hoi An, in Da Nang, next month. What is driving the turnaround? A major factor is rebounding trade growth in the region after several years of uncharacteristic regression, boosted by consumption among the expanding ranks of the middle class in emerging markets such as China, Mexico and Vietnam. Deeper integration of APEC economies has created linkages allowing core industries like agriculture, autos, and energy, and the complex production and supply chains that support them and hundreds of millions of jobs all around the Asia-Pacific, to tap into new trade opportunities. Workers and businesses in South Korea, Japan, New Zealand, the United States, and other advanced economies in APEC are likewise beneficiaries of these dynamics and the improvements in exports, economic growth, and employment they have helped to deliver. This progress is in no small part the product of sustained efforts to make trade easier, cheaper, faster, and more robust in the region — from modernizing trade agreements and keeping restrictive measures in check to technical cooperation to ease barriers at and behind borders in an age of rapid digitalization. Harmonizing data privacy standards to facilitate e-commerce, simplifying customs procedures for goods crossing borders through filing single windows, and opening trade in services sectors like education, healthcare, and tourism to meet burgeoning demand are just a few examples. For economies in APEC and, by extension, the rest of the world, to maximize and sustain the return to growth, it is imperative that this unfinished work continues and goes further to empower those who are not feeling the benefits and raise genuine concerns about equality and fairness in the global economy. Measures taken forward by finance ministers to enable infrastructure investment from the private sector to connect underserved parts of the region, and to expand financing access through improved credit information exchange and digital payment systems are a move in this direction. So too are the reforms being advanced to jointly crack down on corporate tax loopholes that unfairly transfer costs to small businesses and the public, and to improve disaster risk financing and insurance to mitigate natural hazards that disproportionately threaten small scale producers and suppliers. In Da Nang, leaders will have a chance to take important next steps in areas like digital trade and the development of internet economies that are connecting business partners and customers across borders in ways that were simply not possible in the past outside of the grasp of big international firms. Alpaca product producers in the Peruvian Andes, coffee producers and processors in the highlands of Papua New Guinea, and app developers in Ho Chi Minh City, Canberra, Cleveland, and Kuala Lumpur are among the vast pool of next generation traders poised to take advantage of these expanding networks. Leaders will meanwhile face the collective need to do more to help labor forces navigate market competition, automation, and changes in demand, and bolster productivity. It brings to the fore actions like STEM education initiatives, skills training and retraining, and family leave and childcare programs. This is new and potentially rocky territory for a multilateral arrangement like APEC to enter into, with adjustment schemes and safety nets traditionally the domain of domestic policymaking. But then again, the interconnectedness of today’s economies continues to turn conventional wisdom on its head. Dr. Alan Bollard is Executive Director of the Asia-Pacific Economic Cooperation (APEC) Secretariat.